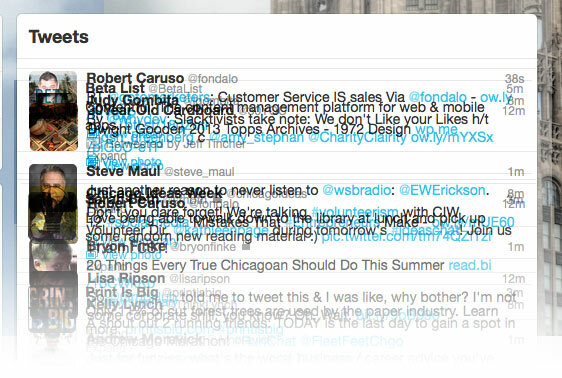 Imagine if all the tweets in your twitter stream were sorted by topic. You could sit down and read all the tweets about sports at once. All the tweets about local items would be in another section. Then you could filter out other tweets you wish to never see like foursquare check-ins. How far your friends ran this weekend. Or maybe you’d like to see how far your friends run, but you’d rather have that filtered into a running section. Do you sometimes get annoyed by people who constantly tweet articles about social media? But perhaps certain times you do find social media links interesting. Those tweets can be in a social media section. All we need is a twitter reader that will analyze the words in each tweet and filter them into particular sections. Twitter lists don’t work particularly well, because humans are multi-faceted. Everybody has a unique blend of interests. I can subscribe to Craig Mod who has a great mind for publishing, and put him into my “digital publishing” list. But then Craig’s tweets about airlines and traveling don’t exactly fit into the digital publishing list. I’d love to have Craig’s tweets about digital publishing filtered into a section on that topic alone. Newspapers have sections for a reason. Imagine if the newspaper took all the articles by their columnists and content by syndicates and put it in random order. Completely random. That’s what we currently have with twitter. We need a twitter that can sort the tweets by topic. Does anyone know of a Twitter reader that will filter tweets by topic? Do people want to read content by topic? […] targeted to a reader’s interest is a cornerstone in publishing.